Hyperlocal network EveryBlock has added support for charity site DonorsChoose.org to its network of hyperlocal news sites. The feature sees EveryBlock include fundraising drives for local schools in each specific area it covers via the addition of of the “classroom fundraisers” section. 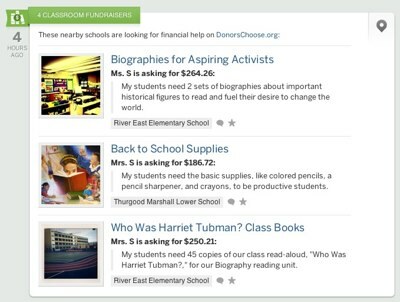 DonorsChoose.org has become a popular site for school fundraising in the United States, particularly across the new media and startup sectors.